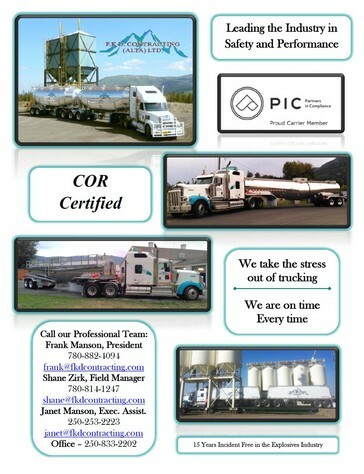 FKD Contracting Alta Ltd. is seeking elite truck drivers for specialized hauling. This opportunity pays well and features a benefit package. Requirements for successful applicants are: Class 1 driver's licence with air brakes, and minimum 5 years driving with off-road experience. Experience hauling with liquid tanker preferred but willing to train. Criminal record check, driver's abstract, and drug / alcohol test must be completed and successful to qualify. Our company hauls from various locations.